No clue. It's just the style that particular vendor offers in their kit. The frame came with the crossmember already welded in. There were spindles and smaller rotors in a box along with the rack and tie rod ends. My brother opted to buy a complete brake kit, control arms, and sway bar from a seller local-ish to him and have it shipped to us. Clutch, the Albatross needs waaaaay too much bodywork for a 2 tone paint job. I'll stick with white; it hides dents. Today, I helped my ZR1 buddy work on his garage heater, then shot up to the dentist's place to help him test fit the Edelbrock supercharger on his pro-touring, LS3 69 Camaro. 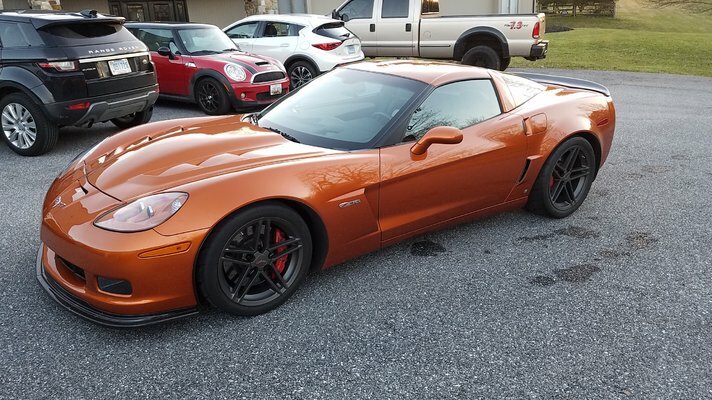 Just as I was about to leave, his buddy showed up with this badass Z06 that dynoed 680 to the wheels, n/a. I still have one side left to do, but that is where all my drivetrain stuff lives. That will be a hard fought battle. Took my CVPI to Walmart to get its oil changed. Went to pay and some big guy cut me off in line at the cashier and kept going on about his daughter's tires. Later, when I walked outside to get in the Crown Vic, saw the same big guy staring into it. Face on the glass and all. Walmarts are really full of weirdos. HO 305 powered Regal with CCC. TES headers, 2040 Crane Powermax cam, ZZ4 intake, 9.5 compression, 2500 stall converter, SMI built CCC Qjet, 3.73 POSI rear. Finally got my last wayward project home from Iowa. I get it. You just haven't seen how f-ed up my truck is! But, I have plenty of Deep Jewel left over.